This epistle focuses on the critical doctrine of how we face adversity and how we are to think about it in our lives. The key word is the word for suffering and its many synonyms. The purpose is to remind all believers that God has a destiny and a future inheritance for them. What we think of as speed bumps interfering with our personal plans are actually God’s training tools and are to be expected, rejoiced in, and not dreaded. 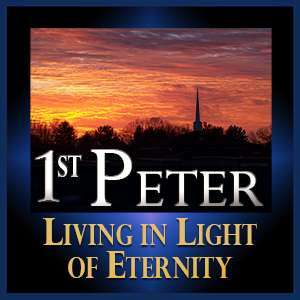 To view all video Bible studies of the 1 Peter series, click here. What is the place of works in a person’s life and what are these works? Listen to this lesson to learn that while salvation is a free gift, works done by believers under the filling of the Holy Spirit are rewarded in eternity. Find out the different judgments awaiting the human race and how unbelievers are judged on the basis of their works at the Great White Throne judgment. Hear how Old Testament believers were justified. When life gets tough and we are under adversity, we need to focus on the end game and the rewards that God has planned for believers. Why does Peter tell Christians to conduct their life in fear when other Scriptures tell us not to fear? Listen to this lesson to understand why fear of the Lord is an important motivator to live our life in the light of the Judgment Seat of Christ. See that if you walk by means of the Spirit you produce rewardable works instead of sinful deeds. Understand that our evaluation is designed to show what has eternal value and that this involves our relationship with God and learning the Word of God. Includes a brief presentation from Jeff Phipps on their recent missions trip to Natal, Brazil.